At one time, it was all the rage to bring the outdoors in to offer greater peace and relaxation by incorporating the outdoor elements in the home. It works. However, people started considering taking the indoors out, and they have experienced numerous benefits from doing so. The first thing people need to do is to build a deck to expand their living space. There are several deck designs to choose from, and the possibilities of adding an outdoor room onto your deck are numerous. Adding an outdoor kitchen onto your deck provides the best of many worlds: it keeps the house cooler inside; cleaning up any spills outside is a breeze; it’s an excellent place to entertain numerous guests or hold children’s birthday parties to avoid indoor messes and allow easy access to outdoor games and activities; the heat from cooking instantly lifts away. Your guests will love eating outside on your deck and enjoying the weather while they watch you cook! 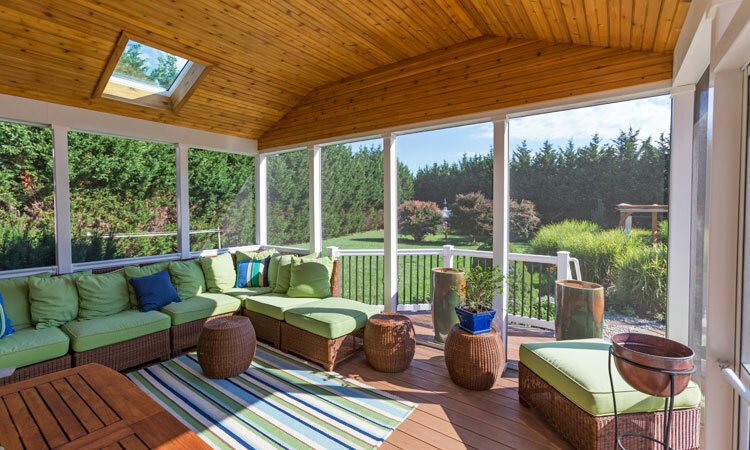 Setting up an outdoor living room on a deck is a trend that is quickly catching on. Use of weather-resistant furniture with extra comfy cushions makes staying outside loads of fun. Make sure to use shade to avoid being in the hot sun. This can be accomplished with the use of pergolas, gazebos or a covered patio. At night, use miniature lights to enable sight, but dim light for a relaxing atmosphere. An outdoor movie room causes many people to reminisce about drive-ins that were once popular; however, the back deck affords homeowners all the comforts of their home. A screen can be suspended from the house or decking structure, such as a pergola to create an outdoor movie theater. Keep extra cushions, pillows, and throws for a relaxing and fun time with the family. When the weather is colder, an outdoor deck heater can keep everyone warm. Get These Deck Trends from Deck Craft! Choosing PA deck contractors like us here at Deck Craft Plus, LLC can make any outdoor room a possibility. Choose a deck design and deck builders in PA can make it a reality. A deck designer can help to decide on the perfect deck. The best part of being outdoors is the open fresh air, but it also frees up space indoors which can be used for a variety of purposes as well. Create a guest bedroom or office with the freed up space. The outdoors affords more flexibility with decoration and uses. Keep it shaded or comfy and heated during the colder months for instant success. Call us to get started on your new deck today!